SynthPunk's blog: 1st post. analogue modular video synth stuff. 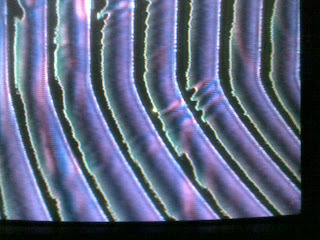 the above picture is a still from the video synthesizer ive been designing and building over the last year or so. its a fully modular system, mostly inspired by the Sandin Image Processor from the early seventies and the Supernova 12 system built for Australian band Severed Heads. its been prototyped and is currently in the construction phase. i plan on sharing the progress i make on this build (and whatever else i happen to be working on thats fun or interesting) in this blog. hopefully other people will be inspired to make an analogue video synth too- i reckon that analogue image manipulation techniques never really got the chance they needed back in the seventies to really mature creatively by becoming accessible to a wide spectrum of visual artists (in the way analogue synthesizers did for musicians) before digital processing came in and replaced them completely. boo. to this end, ill be sharing various circuits and pcb layouts and construction tips as and when they are tested, working and im happy with them. i like the idea behind the original Sandin IP's 'Distribution Religion' and many of the modules in my system are inspired by Sandin modules, so i reckon its only fair to share the fun. Hopefully other people will get involved and share new circuits too. stay tuned.